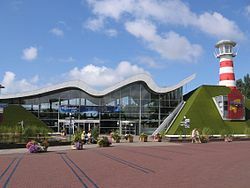 Madurodam is a miniature park and tourist attraction in the Scheveningen district of The Hague in the Netherlands. It is home to a range of 1:25 scale model replicas of famous Dutch landmarks, historical cities and large developments. The park was opened in 1952 and has since been visited by tens of millions of visitors. The entirety of net proceeds from the park go towards various charities in the Netherlands. This article uses material from the Wikipedia article "Madurodam Miniature Park", which is released under the Creative Commons Attribution-Share-Alike 3.0 License.